On the roof above April’s apartment, the Turtles are getting ready for their exercise routine by blasting each other with the fire hose, when suddenly Renet falls out of the sky and right on top of them. 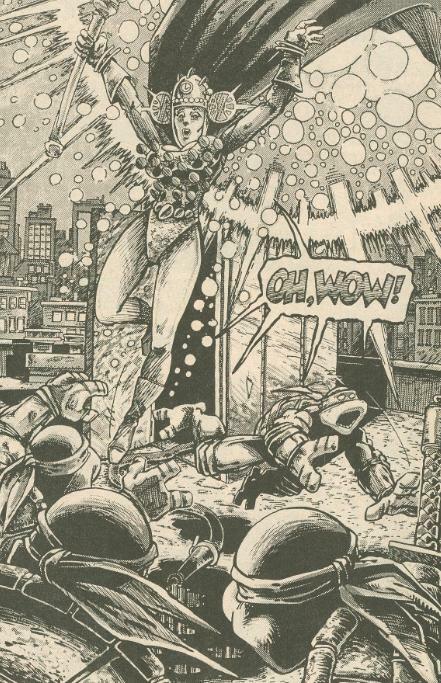 The Turtles introduce themselves to Renet (who is psyched to be in circa 1980s Manhattan, but who wouldn’t be? ), but wouldn’t you know it? The giant glowing head of Lord Simultaneous appears above them, demanding Renet return. Renet freaks out and asks the scepter to take her and her new Turtle buddies as far away as it can; to before humans recorded history. And in a flash, they’re gone. In the year 1406, Cerebus the Aardvark is dealing with some barbarian goons he’s hired for a fortress raid when Renet and the Turtles pop out of the sky and, yeah, that’s right. They land on top of him (lotta that goin’ around). Their arrival piques the interests of the demonic overlord residing within the nearby fortress, Savanti Romero, who recognizes the presence of the time scepter and orders his Captain to rally the guards. Savanti attacks, just as the Turtles and Cerebus were coming to terms, and blows them all away with a single wave of his hand. As the heroes lay unconscious, Savanti scoops up the time scepter and returns to his fortress. Eventually, everyone wakes up, leaving Renet to explain that the Turtles can’t go home until they get the scepter back. Cerebus agrees to help them raise an army to lay siege to the fortress if he gets to keep any treasure they find in the joint. A few hours later, at Chet’s Tavern, The Turtles and Renet sit around drinking as Cerebus works his charm. By telling the local army that Renet is actually Myrtle, Queen of the Mystic T’Capmin Tortoises who grants an army invulnerability for one day every hundred years, he pretty much has the goons eating out of his hand. Early the next morning, Cerebus sits pondering to himself that maybe he doesn’t need to steal the set of scrolls within the fortress that he promised a certain wizard and that said wizard’s magic couldn’t possibly work at such a distance. 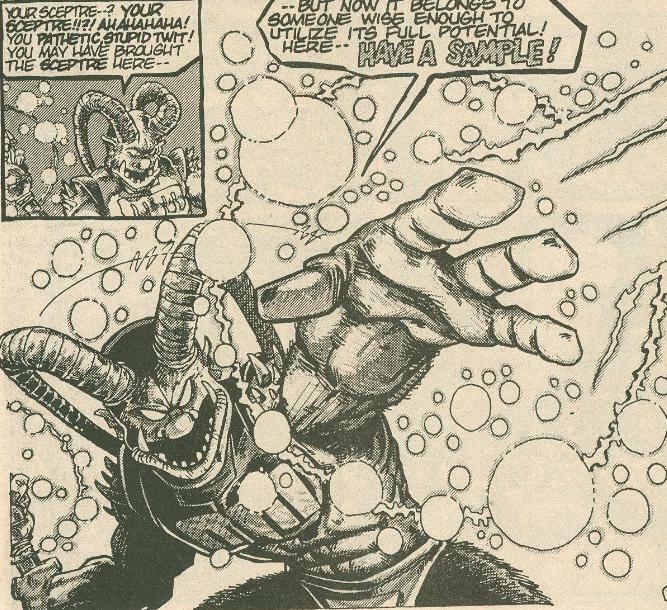 Cerebus focuses back on his mission after the wizard briefly transforms him into a hideous blob. The sun rises and the armies lay siege to the fortress while the Turtles, Renet and Cerebus prepare their sneak attack. Consulting that most ancient of mystic tomes, “101 Uses for the Sacred Sands of the Time Scepter”, Savanti counter attacks by raising the dead buried in the fields just outside his fortress. Meanwhile, our heroes covertly scales the outer wall and reach the walkway above. Cerebus IDs Savanti’s tower and the gang heads toward their target, though they have to cross 100 yards of warriors to get there. As the zombies slaughter the rebels outside, the Turtles make it past the guard and to Savanti’s tower. Savanti is unfazed and quickly incapacitates them with lassos of energy. As he plots their destruction, said plotting is interrupted by the giant head of his arch-nemesis, Lord Simultaneous. As it happens, Lord Simultaneous is the one who caught Savanti scheming to overthrow him, mutated him into a demonic beast and banished him to the 1400s. Savanti threatens to use the time scepter on Simultaneous, who merely laughs the threat off and transforms into his true form: a short old guy in a silly hat. Savanti desperately attempts to blast Simultaneous, but his power has no affect. Simultaneous reveals that the time scepter is old news; he’s equipped himself with the latest in time-space technology, the Digital Cosmic Quartz (a wristwatch). Playtime over, Simultaneous makes the sniveling Savanti vanish with a snap of his fingers. Simultaneous then addresses Renet. While he’s impressed by her attempts to retrieve the scepter, he’s gonna punish her anyway for stealing it in the first place. The Turtles warn him not to harm her, and rolling his eyes, Simultaneous teleports them away. Approaching Cerebus, Simultaneous piles him with the scrolls he was looking for and sends him on his way. Last but not least, he tells Renet its time to go home and face the music. Savanti Romero finds himself trapped in the age of dinosaurs. Cerebus has been transformed into a blob again by the wizard, who wants him to hurry up with the scrolls. The Turtles find themselves back in New York, albeit unceremoniously thrown into a dumpster. Renet has received her punishment; she’s to spend a week dusting, and with chains on to make sure she keeps out of trouble (two weeks, actually, because she calls Simultaneous a butthead). *This story is continued from Michaelangelo (microseries) #1. The story continues in Donatello (microseries) #1. 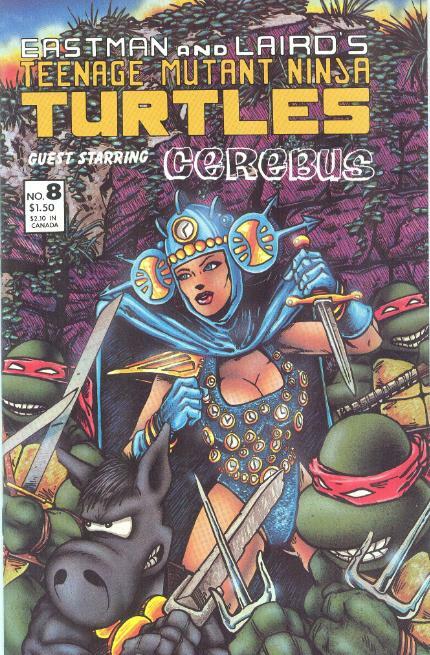 *The Turtles will meet Cerebus again, non-canonically, in Miami Mice #4. They’ll appear alongside him again, canonically, in The Savage Dragon #41. Until that story becomes noncanonical after the fact. Whatever. *Savanti Romero and Renet will return in Tales of the TMNT (Vol. 1) #7. *Leonardo will begin feeling time-space after-effects from his exposure to Renet's time sceptre beginning in "Turtle Soup and Rabbit Stew". *Savanti Romero’s name is a play on horror film creators “George A. Romero” and “Tom Savini”. In fact, “Savanti” is even misspelled “Savini” on page 19. *An alternate, Cerebus-free first encounter with Renet, titled "The Paradox of Chudnovsky", was written by Stephen Murphy and drawn by Jim Lawson in 2007 at the behest of Peter Laird, as he believed Dave Sim would not permit Mirage to reprint the issue. Dave Sim ended up giving Mirage permission and TMNT #8 was included in the 2009 publication, TMNT Collected Book Volume 1, thus making the need for Murphy's/Lawson’s version obsolete. *A new frontispiece and epilogue were added to that story for the 2016 Russian printing, stitching it into the continuity of the Mirage universe. So, technically, THAT was the first encounter between Renet, Romero and the Turtles, although none of them remember it. *This issue also contains a bonus sketch of Cerebus and Donatello by Kevin Eastman and a “Killer Kiwis” pin-up by “Chet Peace”. *CHET ALERT: The tavern Cerebus takes the Turtles and Renet to is called “Chet’s Tavern”. Additionally, “Chet” is scrawled onto the dumpster the Turtles land in. The name “Chet” was an in-joke thrown into numerous comics by the Mirage crew because… they just liked the name! *This issue was originally supposed to contain a back-up story by Ryan Brown, “Rion 2990”, but complications delayed it until TMNT (Vol. 1) #9. It wound up not being published there, either. TMNT #8 is one of my favorite issues of Volume One and probably the book's best exercise in the one-off episodic style of storytelling that would eventually dominate much of it. The issue’s full of great action, but best of all, it never takes itself too seriously. That aside, TMNT #8 just has a story that is paced really well, as the Turtles are thrown from one inexplicable misfortune to another at a machinegun pace, with each sequence segueing into the next perfectly. I think my favorite moment in the whole story happens on page 20, as Leo loses his cool and just expresses his overall annoyance at how the Turtles are always just trying to mind their own business but end up being thrown into outrageous situations anyway. So much quality face-palming on that page. At 45-pages, this issue is positively packed with content, and while the story zooms by at a breakneck speed, it still retains an epic and exciting quality that other TMNT stories attempting a “fantasy/dungeon crawler” approach just can’t equal. Eastman and Laird (and Sim and Gerhard) are really at their finest in this one, jam-packing the pages with lots of expressive details and a great sense of comic timing; page 22’s shot of the Turtles all sitting in the tavern with various expressions on their faces being a perfect example. So far as Renet and Savanti Romero go, I’ve always been partial to them moreso than other returning characters in the Turtle universe. Though Renet more often than not is never drawn very well, and scarcely ever actually looks like a teenager, I still like her as a character; her innocent and blithering behavior being a nice foil to the godlike powers she possesses. Savanti would appear quite a few times as a villain, though I found his best portrayals to be the ones that highlight his comic ineffectuality as a villain. His goofiness is laid on pretty thick in this comic (check his magic spell on page 31), and I think playing up his comical side is the right approach, as he’s just a generic “conquer the universe” type of villain and any attempt at making such a foe “grimdark” just comes across as boring. TMNT #8 is one of the real highlights of Eastman and Laird’s original run on the title and, in my opinion, their best effort since the first issue. Even as someone who prefers the urban-level take on the Turtles, I can’t help but love this issue; it’s a perfect example of how you can take the Turtles to “fantastic” places and predicaments in the comics and not lose touch with what makes them awesome. Hey, funny thing! Yesterday i was reading the spanish version of it. So, the one published in spain is not canon, right? Well, I haven't read it or even seen scans of it, but it seems to be a harmless substitution for #8, for what I understand. So I imagine one could go either way, if they so desired. 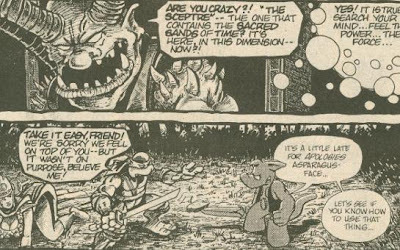 Speaking of TMNT crossing paths with Cerebus, is there any chance you could review Miami Mice #4 in the near future? Or for that matter CBS Action Force #1 (if you can find a copy, that is), Equine the Uncivilized # 3 & 6, Pre-Teen Dirty-Gene Kung-Fu Kangaroos #1, The Last of the Viking Heroes Summer Special #2 and 3, Usagi vol. 3 #1-3, or the Flaming Carrot crossovers? Please? I own all of those save Equine the Uncivilized and Kung-Fu Kangaroos, actually. I plan on getting to them, though I don't know how soon. So many, many TMNT comics; there just aren't enough hours in the day. i read the story and the jim´s version do not change events in the mirage universe. You see that renet and savanti were in love and stuff. Just found your blog and am consistently amazed by your output. I was wondering if you could help me out - There's a 4-page TMNT comic that I saw posted on the old Scansdaily site that I haven't been able to find. It's about a sword and a lake, and throughout the story, there's a sword dividing the comic panels throughout. I also enjoyed the Archie TMNT comics, and am disapointed that they didn't become truly appreciated until after they were gone. The fact that the reprints didn't include the specials that would've made more sense if they'd been included might've contributed to that. Other than Future Tense, there's been a darth of collected editions. And the comic you're thinking of is "Word Warriors", originally published in Quest For Dreams Lost #1, reprinted in the Shell Shock trade paperback. Thanks SO MUCH for narrowing down my search! I wanted to use those pages as an example for my latest blog post, where I combined the pages together into one convenient image. I would've preferred to have used the inked pages, but I'll take my references wherever I can. Debt is absolutely correct Mark, your effort and execution on these reviews has been amazing. Im really enjoying myself, re-reading my collection along with your comments and grades, you sir get an A+. The recent IDW color classics series omitted this issue. Personally I find it exhilerating to reread the originals (and hold each of them in my hand) in color, so it's sad that the collection is already incomplete. The b&w issue's mystique has only been taken up a notch by this though; cementing this book as my favourite of volume one as well.